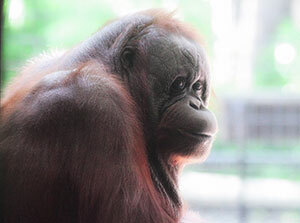 The Milwaukee County Zoo regrets to announce the death of its female orangutan, MJ. The unexpected death occurred the morning of September 14. MJ was 35 years old; born at the Toledo Zoo in 1980. She arrived at the Milwaukee County Zoo in 2007. The cause of death is not known at this time. Preliminary pathology reports revealed chronic health issues, none of which appear to be a single cause of death. Results of a microscopic exam, and additional lab work will be forthcoming in the next few weeks to months. A hybrid orangutan (Bornean-Sumatran), MJ was a beloved member of the animal collection, and will be missed by both staff and visitors.